I haven't done one of these in a couple years, but multiple questions have been raised by people, so I thought it was time to do some explaining. They're very simple, conversational videos about the two styles of stitch bind-offs I like to do. I also refer to http://www.knittingboard.com - they have great videos and demonstrate yet another technique to use. The choices are endless! I used to have an interest in this topic as a super eco-friendly person. I had actually forgot about it until I saw a video on WalletPop (with my fave columnist Bargain Babe). 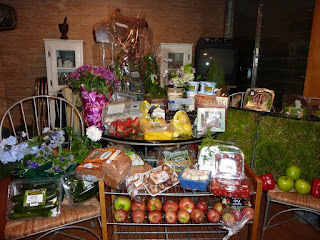 Allison Burtch has a great blog of what is actually being thrown away each night from grocery stores in her area. I have to say, I'm in agreement with her - that has to stop. Why on earth can there not be a "Good Samaritan" law to protect retailers from lawsuits from giving away their food? Expiration dates are set as a precaution - there's tons of food out there that you can eat way beyond the expiration date. Sometimes they're set as a marketing gimmick, too - if I convince you that your food is bad by X date, I'll get you to buy more of it at X date + one day. Check out this find from one night in a dumpster!